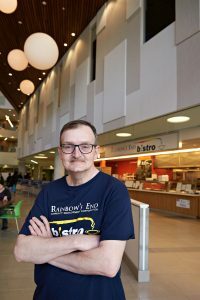 Look behind the stainless steel prep counter at The Rainbow’s End Bistro and you’ll find a pot of gold — a meaningful job for those with lived experience of mental illness. The Bistro anchors the busy food court at St. Joseph’s Healthcare Hamilton’s West 5th location. With a focus on serving healthy, high-quality food, it’s a social enterprise providing training and employment for those living with mental illness. One in five Hamiltonians will experience some sort of mental illness in their lifetime. Many want to return to work, but struggle to find opportunities. The Bistro not only provides its team members with training in safe food handling and exposure to a fast-paced kitchen environment, it proves they can be productive contributors to both workplace and community. With support from an HCF grant, the Bistro is enhancing its training program with six-month paid internships and expanding its catering services. New signage, equipment and marketing help from Mohawk College students are also on the menu.